Accounting, Inventory Management and CRM – all in one software! Masterworks is a full ERP system integrating accounting, warehouse management, inventory management, customer relationships and EDI communications. Designed to meet warehouse management needs for small to medium sized businesses. The right products, in the right quantity, at the right time! Get a free consultation and product tour! Warehouse productivity tracking – reporting by job function, shift and goal setting to provide performance incentives to your over-achieving warehouse staff. Create Bill of Lading and Advance Shipping Notice (ASN) for EDI orders. Systems are built into the shipping confirmation process. Bar code your picking and shipping documents so they can be used with scanners or terminal readers in the warehouse. Automatically create shipping labels for Purolator, UPS, Canpar, etc. Conduct cycle counts and yearly inventory counts for your warehouse. Use RF scanners or paper printed documents for picking. Receiving and put-a-way of warehouse stock to SLOT locations most appropriate for your pickers. You can run multi company, multi division and with unlimited profit centres. Statements can be by company or combined for a corporate overview. Masterworks allows you to create your own custom statements. System is fully audit-able – From the initial transaction to the final General Ledger posting; All details on documents, users and dates are reported. 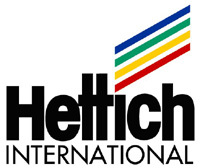 Fully integrated with Distribution system – As orders are shipped, customer accounts are invoiced. No customer can exceed the credit you set without manager overrides. 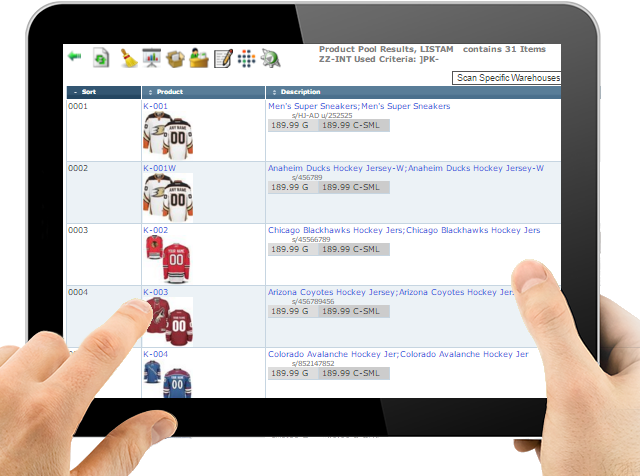 Real Time Inventory Reporting – Customers see information that is always accurate and up-to-date. Detailed Product Catalogue – Product lists can be viewed in several ways including by product code, by vendor, by keywords or drill-down though product categories. These are all automatically created on the web through your product classifications in Masterworks. Security – You limit what products, groups and categories are available on your web site by simple controls in Masterworks. You can also limit customers’ access to specific areas of the site. Customer Specific Features – Customers can create their own shopping lists of commonly ordered products and then use these lists to select products to order from your site again and again. Detailed Information for your Customers – Customers can see open orders, past invoices, shipping dates and times and products that are back ordered. Customers can reprint these documents directly from their browser. Overall very happy with the system. 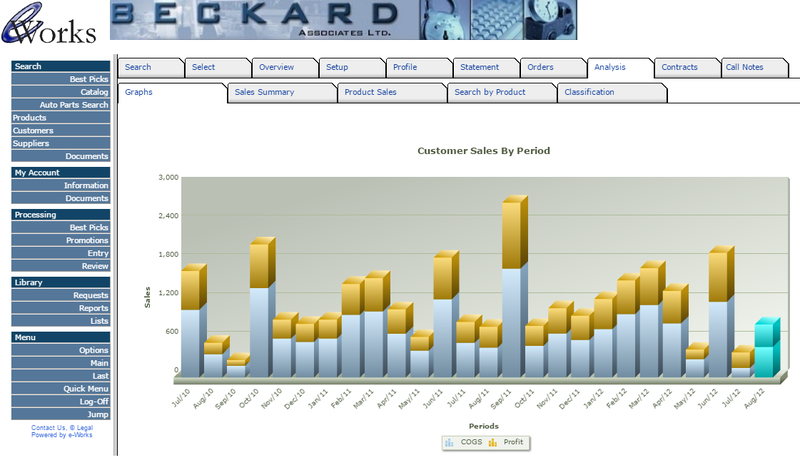 If we have any issues or need customized reports, the team at Beckard Associates always come through for us. Customer service was the most important factor for us when choosing a software to help manage our business. I use the system everyday, both from my office and access while on the road. I like the speed and detailed information it provides to allow me to make decisions on my business. The MasterWorks software is user friendly. The team at Beckard have created some customized software for us in addition to standard MasterWork modules. They are always quick and reasonable and easy to deal with. They are extremely knowledgeable and are able to train and explain the software even to people with limited computer skills and knowledge. I wouldn’t hesitate to recommend Beckard Associates.